London-based Jonathan Tuckey Design and Danish architect Sigurd Larsen have updated the Michelberger hotel in Berlin, refreshing its lobby and guest rooms. The Michelberger now boasts 23 additional rooms and a rejuvenated lobby area with new fixtures and furnishings. Opened back in 2009, the hotel occupies a former lighting factory beside Berlin's Oberbaum Bridge. 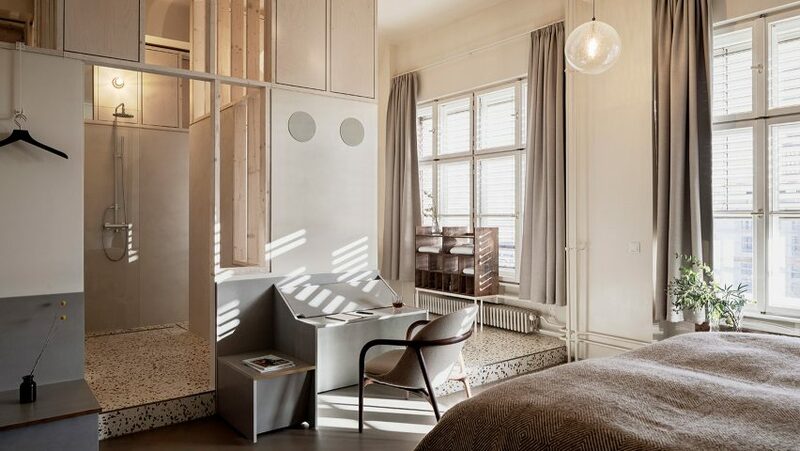 Its low key aesthetic was originally developed by designer Werner Aisslinger and styling duo Anja Knauer and Sibylle Oellerich, who incorporated flea-market furnishings and inexpensive materials throughout the interiors. West London-based studio Jonathan Tuckey Design was tasked with creating the latest series of suites, which sit on the hotel's fourth floor. Intended to look minimalist yet "full of warmth, charm and humility", the rooms have been decked out in a variety of earthy tones. Off-white plaster walls have been paired with mushroom-coloured floors, along with sandy beige curtains and bed throws. Bed frames, shelving units, and side tables have been crafted from light-hued Panerholz – modified plywood which secretes natural resins during the manufacturing process, lending it a slightly time-worn appearance. Terrazzo tiles have been used throughout the bathrooms. "The materials selected had to be tactile and appear nestled within the industrial setting, which would age gracefully and become even more embedded into the interior spaces as the years went by," the studio told Dezeen. Extra windows that look out over the city's Friedrichshain district have also been punctuated in the rear elevation of the building, allowing more natural light into the centre of the floor plan. Image courtesy of the Michelberger hotel. In the lobby, Danish architect Sigurd Larsen has suspended a series of bold, amber-coloured chandeliers made by Berlin Art Glas. Featuring bunches of lightbulbs encased in "imperfect" glass spheres, the lights are meant to nod towards 1950s and 1960s product design. It marks the second time Larsen has worked on the Michelberger, having created two guest suites within the hotel back in 2015. At the time he erected large plywood volumes to sit at the centre of the rooms, which contain a bed, bathroom, and sauna. Larsen otherwise decided to maintain the lobby's arrangement and simply replace the existing seating with new timber sofas. "We all felt that the existing proportions and layout of the sofas in the lobby worked well, with a landscape of low and comfortable sofas which guests can happily sink into and stay for hours," explained Larsen. This isn't the only established hotel to recently have a subtle revamp – last month architecture studio Volta updated an apartment inside Marcel Breuer's renowned brutalist ski resort Flaine, dotting Bauhaus-inspired decor details throughout its interiors. Photography is by Philipp Obkircher unless stated otherwise.